"Buttercup" redirects here. For the variety of squash, see Buttercup squash. For other uses, see Buttercup (disambiguation). Ranunculus /ræˈnʌŋkjʊləs/  is a genus of about 500 species  of flowering plants in the family Ranunculaceae. Members of the genus include the buttercups, spearworts and water crowfoots. The petals are often highly lustrous, especially in yellow species, owing to a special coloration mechanism: the petal's upper surface is very smooth causing a mirror-like reflection. The flash aids in attracting pollinating insects and temperature regulation of the flower's reproductive organs. Buttercups usually flower in the spring, but flowers may be found throughout the summer, especially where the plants are growing as opportunistic colonizers, as in the case of garden weeds. The water crowfoots (Ranunculus subgenus Batrachium), which grow in still or running water, are sometimes treated in a separate genus Batrachium (from Greek βάτραχος bátrakhos, "frog"). They have two different leaf types, thread-like leaves underwater and broader floating leaves. In some species, such as R. aquatilis, a third, intermediate leaf type occurs. Ranunculus species are used as food by the larvae of some Lepidoptera species including Hebrew Character and small angle shades. Some species are popular ornamental flowers in horticulture, with many cultivars selected for large and brightly coloured flowers. 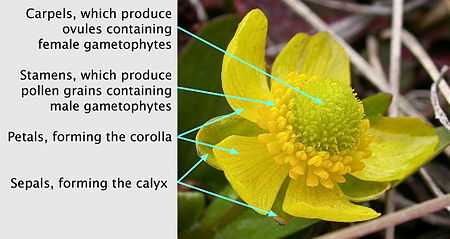 Molecular investigation of the genus has revealed that Ranunculus is not monophyletic with respect to a number of other recognized genera in the family – e.g. Ceratocephala, Halerpestes, Hamadryas, Laccopetalum, Myosurus, Oxygraphis, Paroxygraphis and Trautvetteria. A proposal to split Ranunculus into several genera has thus been published in a new classification for the tribe Ranunculeae. The split (and often re-recognized) genera include Arcteranthis Greene, Beckwithia Jeps., Callianthemoides Tamura, Coptidium (Prantl) Beurl. ex Rydb., Cyrtorhyncha Nutt. ex Torr. & A.Gray, Ficaria Guett., Krapfia DC., Kumlienia E. Greene and Peltocalathos Tamura. Not all taxonomists and users accept this splitting of the genus, and it can alternatively be treated in the broad sense. See List of Ranunculus species for a more complete list with native ranges. ^ Sunset Western Garden Book. 1995. pp. 606–607. ^ Hörandl, Elvira; Emadzade, Khatere (2012). "Evolutionary classification: A case study on the diverse plant genus Ranunculus L. (Ranunculaceae)". Perspectives in Plant Ecology, Evolution and Systematics. 14 (2): 310–324. doi: 10.1016/j.ppees.2012.04.001. ^ a b Van der Kooi, Casper; Elzenga, Theo; Dijksterhuis, Jan; Stavenga, Doekele (2017). "Functional optics of glossy buttercup flowers". Journal of the Royal Society Interface. 14 (127): 20160933. doi: 10.1098/rsif.2016.0933. ^ "Buttercups focus light to heat their flowers and attract insects". New Scientist. 25 February 2017. ^ Edsall, Marian S. (1985). Roadside Plants and Flowers: A Traveler's Guide to the Midwest and Great Lakes Area: With a Few Familiar Off-Road Wildflowers. North Coast Books. University of Wisconsin Press. ISBN 0299097048. ^ Emadzade, K.; Lehnebach, C.; Lockhart, P.; Hörandl, E. (2010). "A molecular phylogeny, morphology and classification of genera of Ranunculeae (Ranunculaceae)". Taxon. 59 (3): 809–828. doi: 10.2307/25677670. ^ Aslam, M.S. ; Choudhari, B.S. ; Uzair, M.; Ijaz, A.S. (2012). "The genus Ranunculus: A phytochemical and ethnopharmacological review". International Journal of Pharmacy and Pharmaceutical Sciences. 4 (5): 15–22. ^ "Ranunculus". Botanical Dermatology Database. Retrieved October 18, 2013. ^ Mai, Dieter Hans (2007). "The floral change in the tertiary of the Rhön mountains (Germany)". Acta Paleobotanica. 47 (1): 135–143. ^ a b English Names for Korean Native Plants (PDF). Pocheon: Korea National Arboretum. 2015. p. 602. ISBN 978-89-97450-98-5. Archived from the original (PDF) on 25 May 2017. Retrieved 19 December 2016 – via Korea Forest Service. ^ خوبانی ربانی, مینا, مهرناز آزادی, بهزاد ذوالفقاری, and پروین دهقان. 2016. "بررسی تأثیر ضد قارچی عصاره گیاه کبیکج جهت حفاظت آثار کاغذی تاریخی". گنجبنه اسناد 26 (1): 104-123. .
^ Li, H. (December 2013). "Evaluation of antiviral activity of compounds isolated from Ranunculus sieboldii and Ranunculus sceleratus". Planta Medica. 71 (12): 1128–1133. doi: 10.1055/s-2005-873169. PMID 16395649. "GRIN Species Records of Ranunculus". Germplasm Resources Information Network (GRIN). United States Department of Agriculture, Agricultural Research Service, Beltsville Area. Retrieved 8 January 2008. Wikimedia Commons has media related to Ranunculus. "Ranunculus" . Encyclopædia Britannica. 22 (11th ed.). 1911.